Contract officers will compensate for dismissed conscripts. 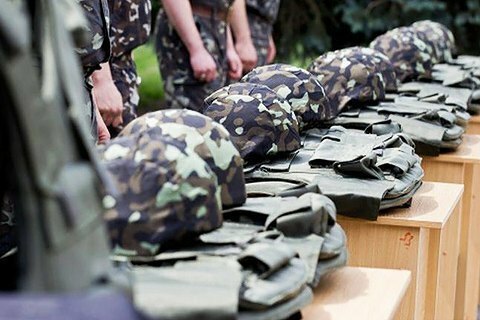 The Ministry of Defence of Ukraine says that a successful recruitment campaign would make a new wave of mobilization unnecessary. "Since the beginning of the year, about 53 thousand soldiers have signed contracts with the Ukrainian army, including 6000 officers. Several thousand people have passed the selection tests and sign the contract after undergoing the required training course. Every month, about 6 thousand contract soldiers join the army ranks. Given this trend, 15-18 thousand will join the army before the end of the year," the ministry said in a release on 27 September. Previously, a spokes officer for the Defense Ministry, Vilen Pidhornyy said 14,000 servicemen should be mobilized to the combat zone. "Ukraine needs more soldiers. We are talking about fourteen thousand new soldiers, who should be conscripted by the end of the year. The probability of the next mobilization wave is pretty high," Pidhornyy said on the 1+1 TV channel. Earlier in the day, President Petro Poroshenko said her has signed a decree on the dismissal of the servicemen of the sixth wave of mobilization. Once they are demobilized, only contract servicemen will remain at the front, the president said. The sixth wave of mobilization took place in June-August 2015.